With the advent of the new style of AHS Convention this June in Milwaukee, Thursday was the day many of the convention goers arrived in Wisconsin. 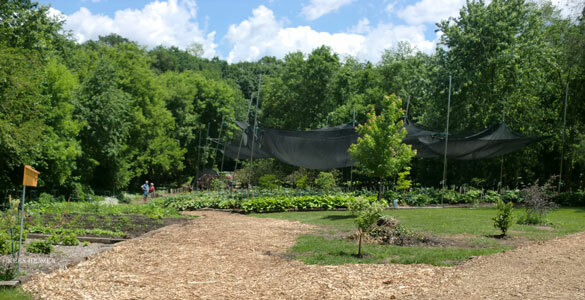 A number of people took advantage of the proximity of Jeff Miller’s Land of the Giants Host Farm to see in person what they had been hearing about it from their hosta friends. Among those making the trek to Land of the Giants for the first time were Keith Frazier (Kansas), Jonathan Hogarth (United Kingdom), and Kees Henzen (The Netherlands). 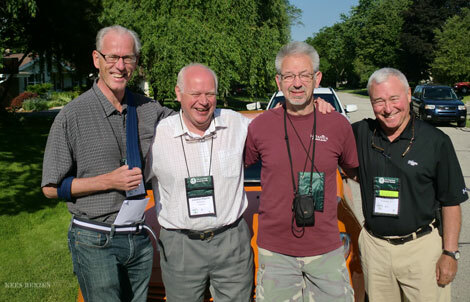 The three men proclaimed themselves “The Orange Team” as Keith had rented a bright orange Dodge Dart for the trip. Also racing to Land of the Giants that day was another international pair, Mike and Kathy Shadrack, better known as “Team Shadrack” for the purposes of this article. Each member of “The Orange Team” has shared their impressions of their trip to Land of the Giants Hosta Farm as did “Team Shadrack”. 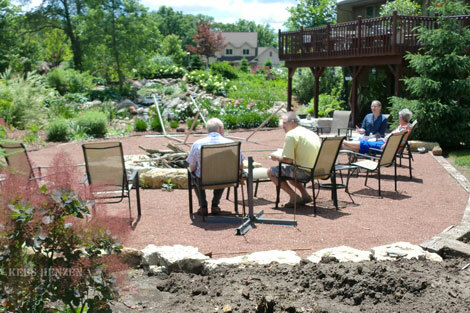 This year’s convention only covered three days and only Friday and Saturday were booked with garden visits. So my plan was that IF I would come over all the way from the Netherlands to Wisconsin, then the trip should at least be extended with another day. 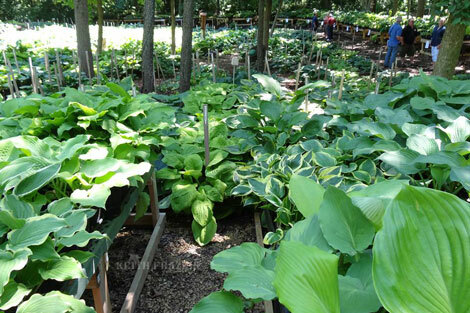 To make that happen, I posted on Facebook within the American Hosta Society group asking whether members had suggestions for additional visits or nurseries in the region. 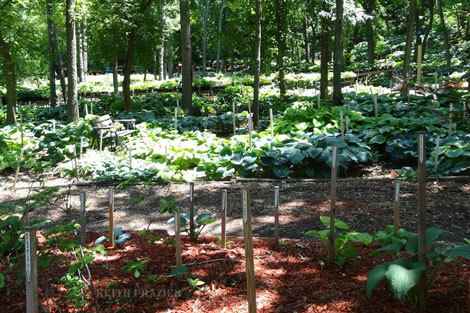 In a day or two, I got a tip from Lisa Putnam and others that Land of the Giants Hosta Farm is a “must do”. That made me decide to “Escape to Wisconsin”, and I booked the flight a day earlier to visit the nursery on Thursday. I already had contacted Jonathan Hogarth from England and my other buddy during the hosta trip was Keith Frazier who picked me up in Chicago. You are not allowed to drive a car with a broken collarbone ... All together we were an interesting international company in the orange car, and early in the morning, we went to the farm. Jeff Miller welcomed us, and we could spend as much time as needed. That is important for me, because I LOVE to take photos of hostas that are on my photo wish list. During lunchtime we were offered hamburgers and drinks. I tried to take pictures of all the “Giantland” hostas and all other rare hostas that were specific to this Hosta Farm. All the hostas were nicely tagged with high poles, and the funny story is that during wintertime people ask if this is a cemetery. My “English Mouse” friend, Jonathan, bought a Hosta ‘Giantland Sunny Mouse Ears’ for his collection and Keith couldn’t resist buying ‘Okaydokey’ and ‘Okefenokee’. After more than half a day, spending time, money and having a nice time, we went back to the convention that hadn’t even started yet! Firstly, Kees thought it would be a great idea to visit Land of the Giants as it was so close to Milwaukee and duly posted it on his Facebook page. Keith was so keen to drive us without delays that he turned on his second satellite navigation system to make sure of a speedy arrival. We drove around and around until one of the traffic directors was turned off. (If it hadn't been built into the car, it would have been thrown out.) Moral of the story: don't mess with hosta folks when they’re trying to find their hosta destination. On our arrival (ten minutes after the navigation mutiny), we were greeted with a comprehensive list of hostas for sale. And what a list, it was enormous! All the plants were well-labeled, and the prices were on our lists. Friends and knowledgeable helpers who knew the nursery were always available to guide us to a name or a plant we had missed. We met the same people later in the tour gardens at the convention. It was an unforgettable visit, good company, good plants, and great hospitality. We travelled a long way and were not disappointed. To put our experiences into a few words, “It does what it says on the label,” it is, “The Land of the Giants.” Can I go back again soon, please? I thought it was awesome! Jeff was so accommodating; he was everywhere for everyone, answering questions, and telling where specific plants were located. He even grilled burgers for lunch. I bought plants, it was great! He didn’t dig single divisions; he dug clumps for us. The “Orange Team” had a blast! We had a great time, joking and laughing. Kees even learned that the ‘b’ in thumb is silent. I don’t know how Kees and Jonathan captured Chuck (Doughty) who rode with us Friday and Saturday. When Kathy and I found out that we were going to have to drive all the way to Milwaukee for the Convention, we knew that we would need to make a lot of stops. The compensation for the long drive was the possibility of planning a trip that let us visit cool places on route. Actually, it was not as far as we imagined and at the last minute we changed our plans and took a day off the front of our trip. But one of the places we had to visit was ‘Land of the Giants’. Wisconsin, after all, was the place where they grew those great big hostas. Or was that a tall story, too? As we drove up to the address, we wondered if we were in the right place. This was a private house, surely not a Land of the Giants. Not a beanstalk in sight. Land of the Giants certainly lives up to its name. It is enormous. The nursery seemed to go on and on. We never did reach the end of it. I think I got up to the L’s and Kathy managed a little further. 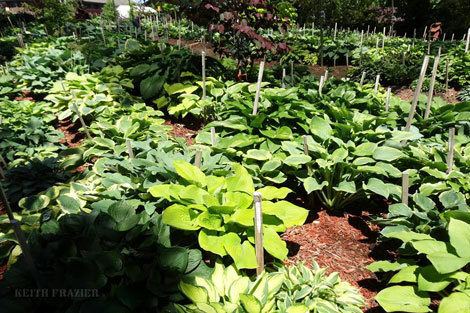 Large numbers of hostas were planted out in rows and behind them were what seemed to be miles and miles of waist high racks overflowing with well-grown hostas. There were even more potted hostas set out on the ground, including a large area dedicated to the minis. 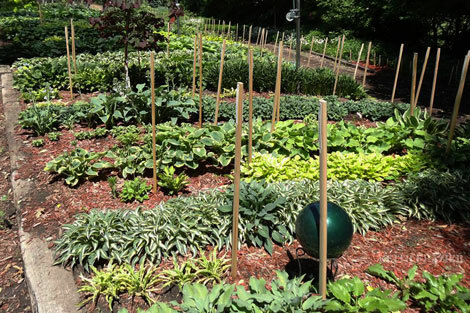 As might be expected at Jeff Miller’s, there was also a large area full of his own seedlings. I suspect that it is from here that so many of those really high value auction contributions come!!! Because time was so short, all too soon we had to pay up and leave. Once more we bought far too much stuff including some real gems. I managed to get Jeff’s ‘Blue Mouse Ears’ seedling ‘Giantland Mouse Cheese’ and a wonderful sport of ‘Light Everlasting’ that Jeff generously let me have, although he clearly would have liked to have kept it for himself. Kathy managed to find ‘Skylight’, an almost turquoise, blue hosta from the Stegemans. Kathy was thrilled saying, “This is a hosta that had been on my 'Wish List' for years, and I had many to choose from. I could have spent a day there, easily and happily.” Sadly we had taken that day out of our plans.